We just watched Beauty and the Beast Live on Stage. I hate that this show may be going away soon. It's so pretty. What? Why??? I love this!! Thanks so much for visiting us and reading this post. Please leave us a message because we love to hear your Disney stories and tips too! Too busy to visit us regularly? 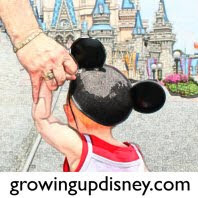 Then get Growing Up Disney by email! Good morning from the Studios! Copyright 2010-2018 Amy Eastman. This is an unofficial Disney blog and is in no way affliated with any entity of The Walt Disney Company. Please check Disney.com for official information. We are always happy for you to share a link to Growing Up Disney, but let's play fair. The photos on this site are my family's unless otherwise credited. Please do not reuse any photos or text without permission of the owner/author. Logo and graphics by Michelle Harlan (@mmharlan on Twitter). Picture Window theme. Theme images by cmisje. Powered by Blogger.